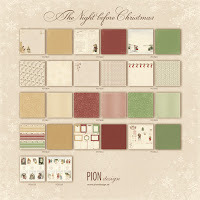 Today I'm sharing another Christmas card made using the Pion Design collections "The Night Before Christmas" and "Greetings From the North Pole". You know how when you buy a package of paper, you always use the bits with the pretty designs on them first, and then you end up with a bunch of pieces that have only a pattern, well here is how you can put them to use! The wreath is made of Holly Leaves from Die-versions and a branch punch from Martha Stewart. I used DecoArt Writer for the snow and covered it with white Flower Soft. The frame is Tim Holtz Bookplates and Tag die. The pinecones are from the yard and everything else is from my stash. Well the snow keeps coming and I don't mind it a bit. I find it so beautiful and so peaceful. No construction noise, no tourists at the lake, no thumping of basketballs at the community centre, no crazy people on bikes, skateboards or scooters, just a few people enjoying the quiet. I love it. 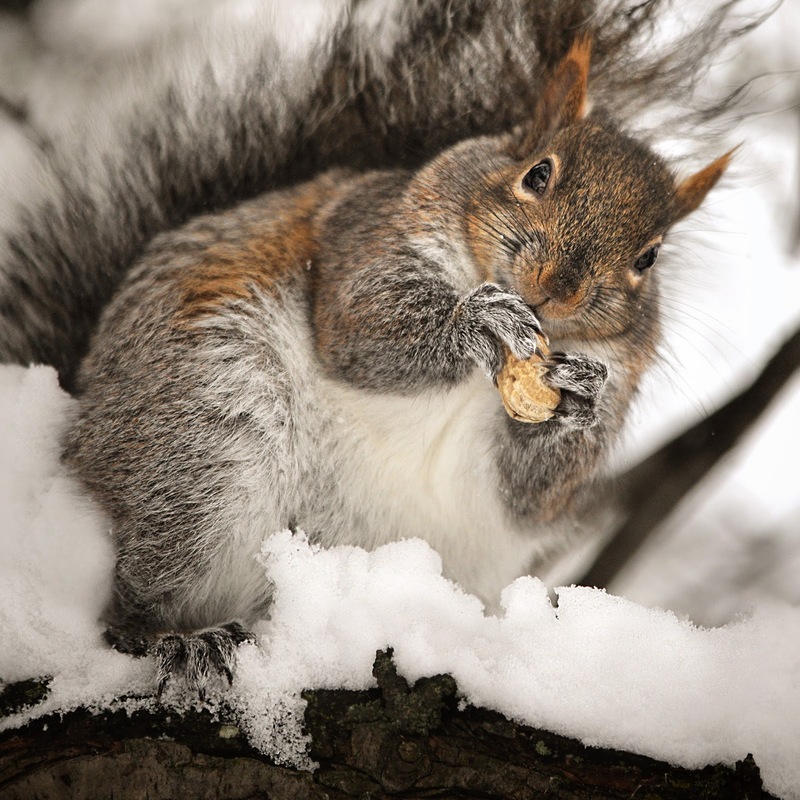 The poor squirrels are having a hard time with the deep snow. The food I throw is getting lost and they are up to their necks in it. I have started making clearings for them so they can come grab something from the pile, then scoot up a tree to eat. "Ohhhhhhh, brrrrrrrrrrr, give a girl a break and toss a peanut already!" As promised, an updated photograph of my darling sweet KAREN. She is the only one left from the original group of squirrels that started visiting when I moved in. Doesn't she look adorable with those fat cheeks!! "Dear Santa. All I want for Christmas is a little less wind!!" 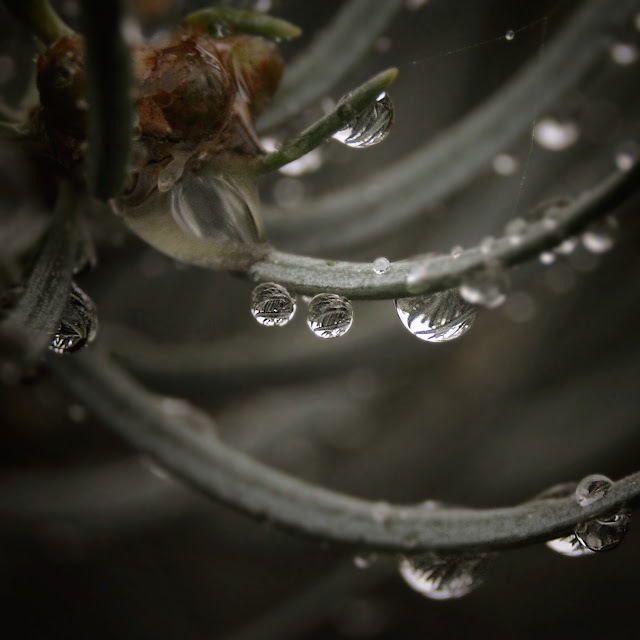 It's still way too windy out to get any good macro shots, so I'm sharing an older one from a rainy day in the fall. That's it for today. Thank you for stopping in and for all the amazing comments. 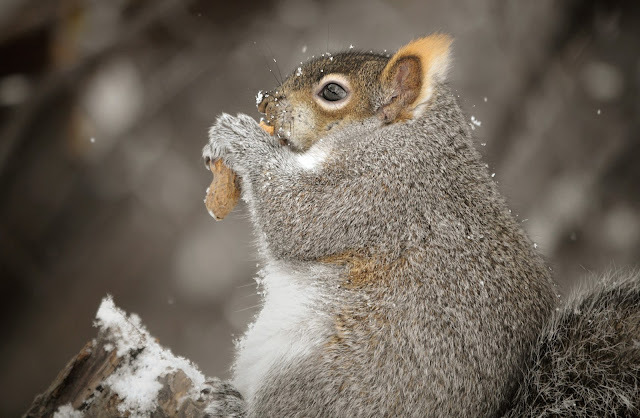 Don't forget to feed a squirrel or a bird today. It's a tough time of year for them outside, while we are cozy and warm inside. Stunning once again pamellia. Love the traditional colours the wreath is gorgeous and pretty image. Wishing you a lovely Christmas looking forward to seeing you projects next year. The card today is stunning with the old fashioned colours and image. Great way to use the bits of left over paper. 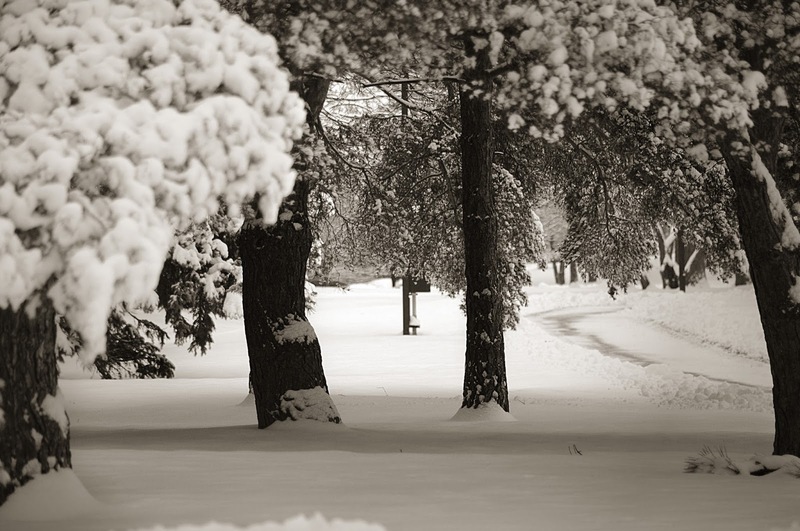 Beautiful snow pics and a shame they are clearing the paths as it does look nice when it is all snow covered. The animals and birds seem happy with it all as well. Enjoy it while it all lasts. Another divine card! That wreath is stunning and I adore those tiny pine cones .. want some!! LOL!! Love the traditional colours and the flower soft looks wonderful!! 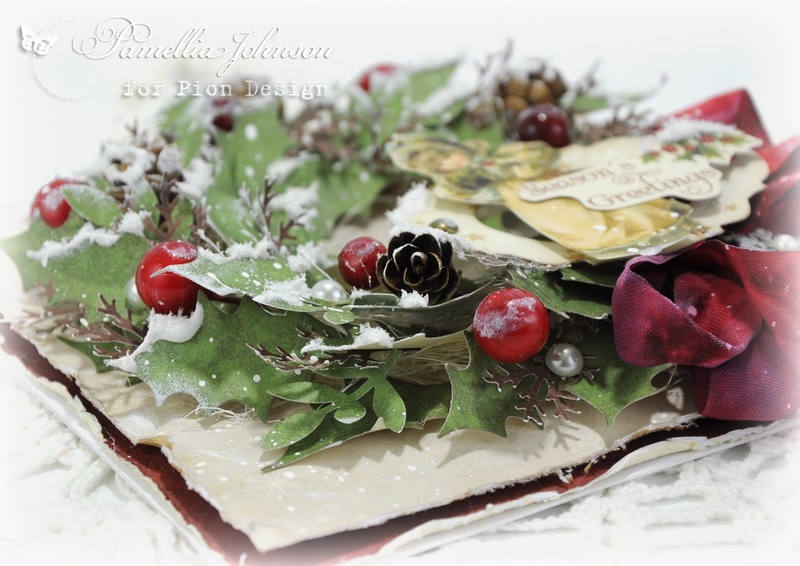 A lovely card Pamellia, the holly wreath looks stunning. Beautiful picture and what a lot of snow. I just need time for a catch up to see what other beautiful creations you've been making. 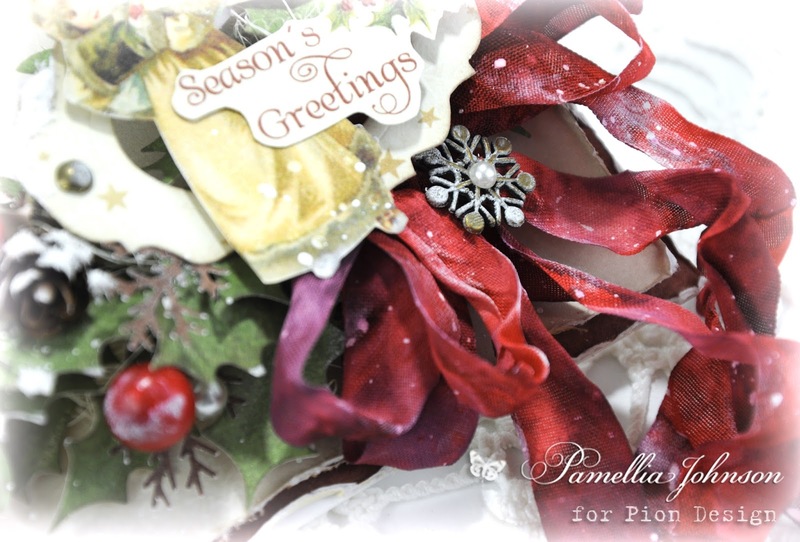 Gorgeously festive card Pamellia! You can never go wrong with fancy wreath in my opinion. A drop dead gorgeous festive card, Pamellia! Your holly wreath is beyond stunning and it's the most beautiful wreath I saw this season! Your snow looks so realistics, as always! You really know how to achieve some super cool snow effects! The pine cones are fabulous and what a super clever way to use bits of left over papers! I am in love with your perfect fluffy bow and your spectacular design! Ooooohhhh!!! Amazing!! Your card with is just breathtaking!!! Such a wonderful look it has with that wreath!!! 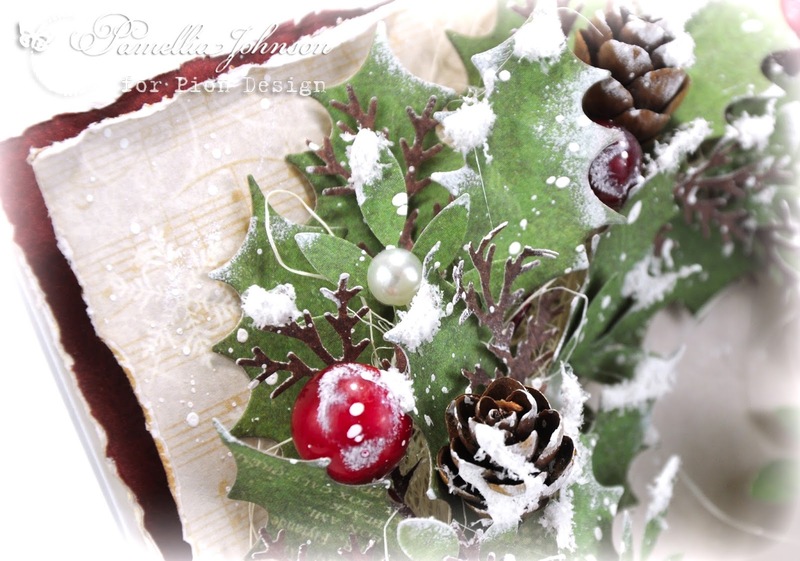 It seems a real wreath with these fab leaves nd branches, the pinecones, the berries and the snow!! LOVE it!! 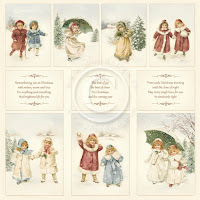 Fab vintage image, too, and beautiful ribbon and snowflake charm! A true delight! I understand very well your feel aboutthe quiet, I too love the silence of nature and don't like people in vacation :) LOL Your landscape is a dream, as well the macro of the drops. 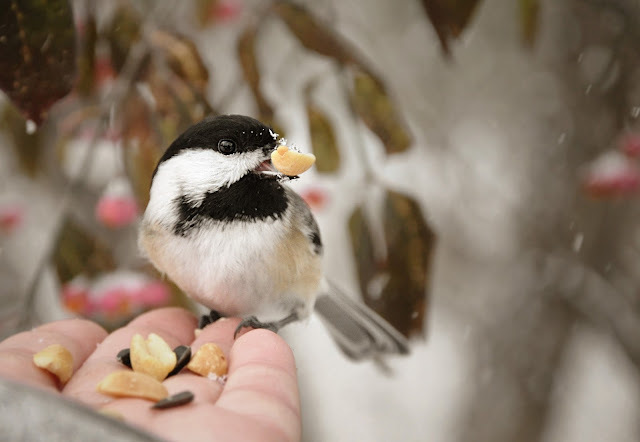 Nature is just magic!1 Fabulous photos of the birdies, they are so tiny and cute!! 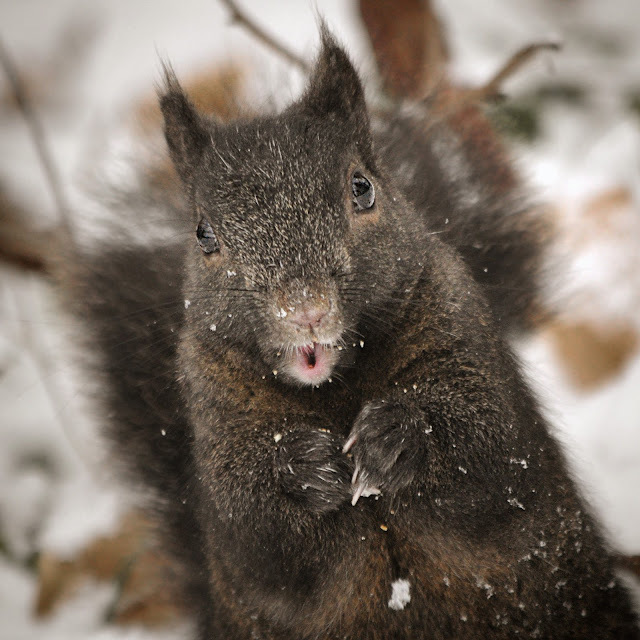 And the squirrels photos today are so fun with their faces! Your words for them always make me smile :) You make so well to give them a pile of peanuts, so they haven't to enter too much in the snow for founding them! I wish that Santa takes to Carol what she wish! :) Adorable little squirrel! Beautiful card, Pamellia! Wonderful idea for scraps as well. Love your photos and am jealous of the snow! We had a dusting of snow yesterday. More is expected tonight but will be changing to rain tomorrow. I have been tossing bread crumbs outside for my furry friends. 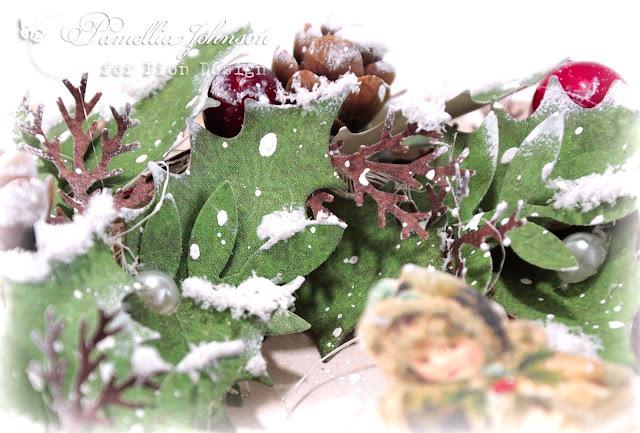 A truly beautiful festive card with that special Pamellia touch! The wreath looks amazing and the snow is so realistic! Your snowy photos are beautiful...I love the look of snow, so pure and still but actually am not at all keen on the reality...we don't seem to cope to well with snow in the UK, well not here in the south anyway! A stunning wreath Pamellia..I love the dimension of it with the pinecones and berries and that sweet little girl..beautiful. I love your snowy photos and the wee Squirrels..I dont get snow here so can only enjoy the wonder of a snowy winter by imagination and photos..and as I am in the middle of Summer my imagination finds me needing some snow..
Oh my goodness, this is absolutely stunning, Pamellia!! Wow!! The wreath looks amazing!! I love how dimensional and layered it is!! The pine cones and berries and the snow are all perfect touches!! I would love one like this for my door!! It's spectacular!! And I love the vintage image of the sweet little girl, too!! Gorgeous, gorgeous card my friend!! HOLY MOLY! That wreath is stupendous! LOVE IT! And what a gorgeous shot of the Shires! I'd love to come walking with you... Fabulous photos as always and I love the macro shot! 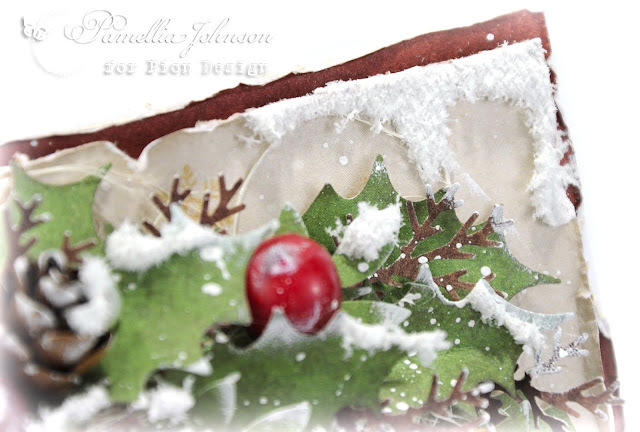 Stunning festive card design Pamellia, wonderful papers and layers of embellishment..just gorgeous. Fabulous photos, I adore those bird shots, wish we had them over here and of course your beautiful squirrels. Its a gorgeous card, love how you used the darker traditional colours on this one. Fabulous photos of the birds and squirrels. Totally stunning card Pamellia, amazing design with those papers and embellishments, the wreath is so colourful and just Pops out at you. 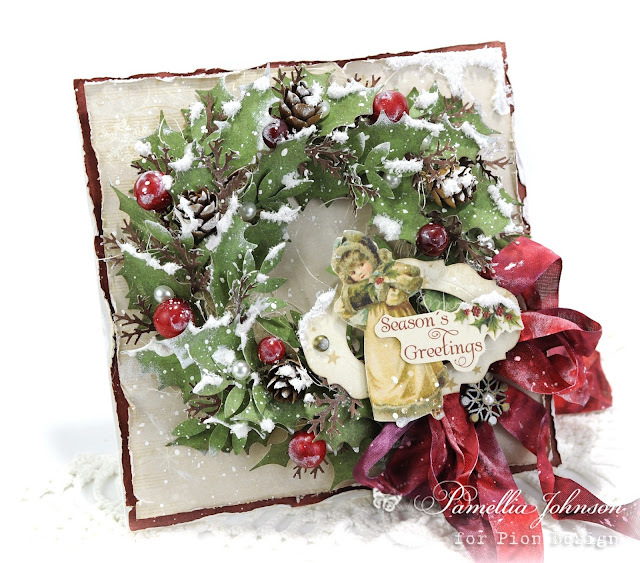 What a stunning card Pamellia - love all the dimension on the wreath!! Your photos are so touching - those birds and squirrels are so trusting of you. Hello, my dear Pamellia! I am SO happy to be back! You did not miss a post... I forgot to tell everyone I was moving! Ha! Thank you for leaving me love while I was off getting married and moving. I have dearly missed your posts and am happy dancing in my chair right now. :) Your card is spectacular beyond words, my friend! I adore wreath cards and naturally yours is amongst the loveliest I've seen. The holly leaves are so pretty and I love all of the elements nestled within.. especially the touch of nature with the pine cone! Amazing. The ribbon is so pretty and I love the Christmas sweetheart to sparkly bits! Gorgeous design, as always. 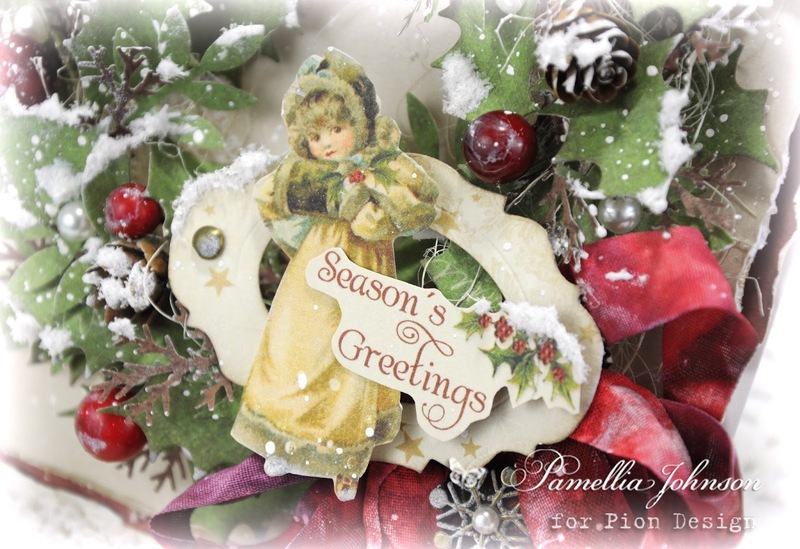 Pamellia, it is so hard to believe this lovely card was made from your "scraps"! 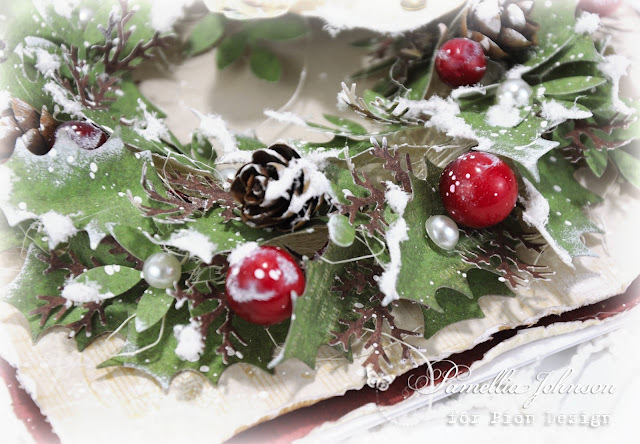 You've put together the loveliest and fullest of wreaths; I just love the bits of snow and those berries, pearls and pinecones! Wow, they're from your yard?! Lucky you! We only have those ginormous ones that are almost as big as a football! The sweet girl is the perfect image and your shabby bow is amazing!I'm very drawn to your rich colors and simple design! Perfect! Loving your photography as always, but that landscape shot has me green with envy! It's great the walks were cleared, because that snow looks pretty deep! I think that's more than we've accumulated in the past 15 years! Reminds me of home up north. All we are getting here is cold rain and this morning, lots of fog. Yuck! Sending hugs and wishes for a peaceful weekend. Gorgeousness card!! I so love the branches! 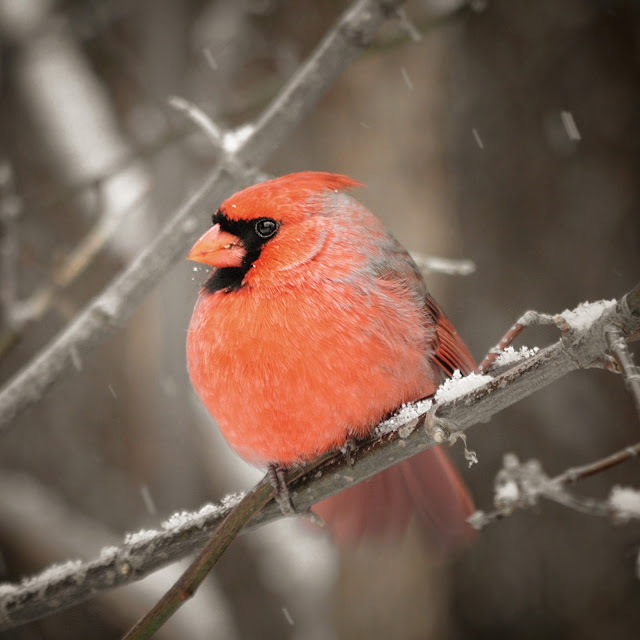 Fabulous creation my friend and loving all the photos of the beautiful birds and squirrels, I am sure they appreciate you feeding them in such bad weather but my it looks fabulous, so beautiful, we have not had it that bad here for quite some time. I am now going to look over your blog to view your beautiful posts that I have missed. Such lovely layers on this card! Need a tutorial !! This is an amazing card. Love it. I'm going to go try it! And love your photos. I love the nature scene. I like to know that there is someone else who takes pics of every bird too lol. Card and photos are STUNNING STUNNING STUNNING! Pure joy. A truly stunning card and what a fabulous way to use up bits of left over papers. The wreath is stunning with the additional berries and pinecones and the shabby bow is gorgeous! This is a beautiful card. I love all of the dimension and the design. So Christmas-y. 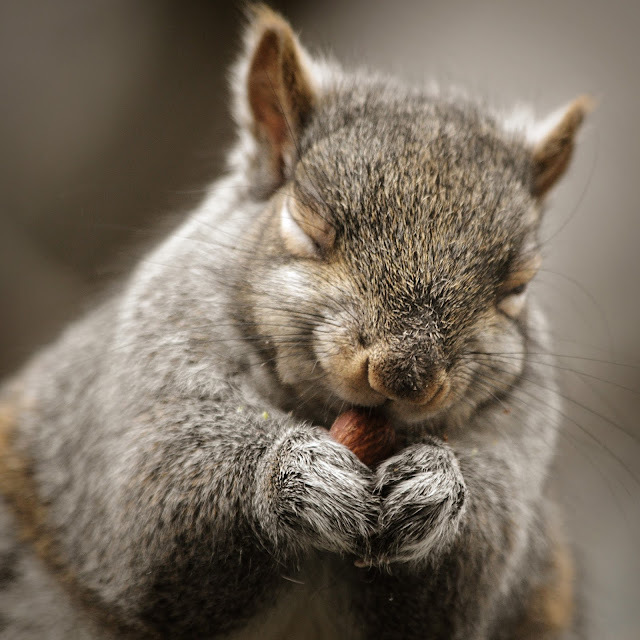 The little faces of the squirrels in today's photos are absolutely precious. A completely stunning Christmas wreath card, Pamellia - it just makes my heart sing. And wow, the Shire looks glorious as a Winter Wonderland... fabulous to see a cardinal in the flesh, and the squirrels are as delightful as ever. Always so delightful to visit you. LOVE all the photos, and your wreath here is wonderful. LOVE the snowy details. I'm thinkin' it was a test of patience to put this INCREDIBLE wreath together! But what an accomplishment because it is totally STUNNING. I adore it. And sooo sooo happy to see Karen - YEAH... I know she is glad to see you too. Xj. Gorgeous card, I love your wreath, all the leaves look amazing especially with the berries and tiny pine cones. 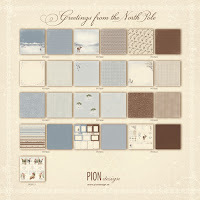 I love the effect of Flower Soft when it is used as snow, terrific card. 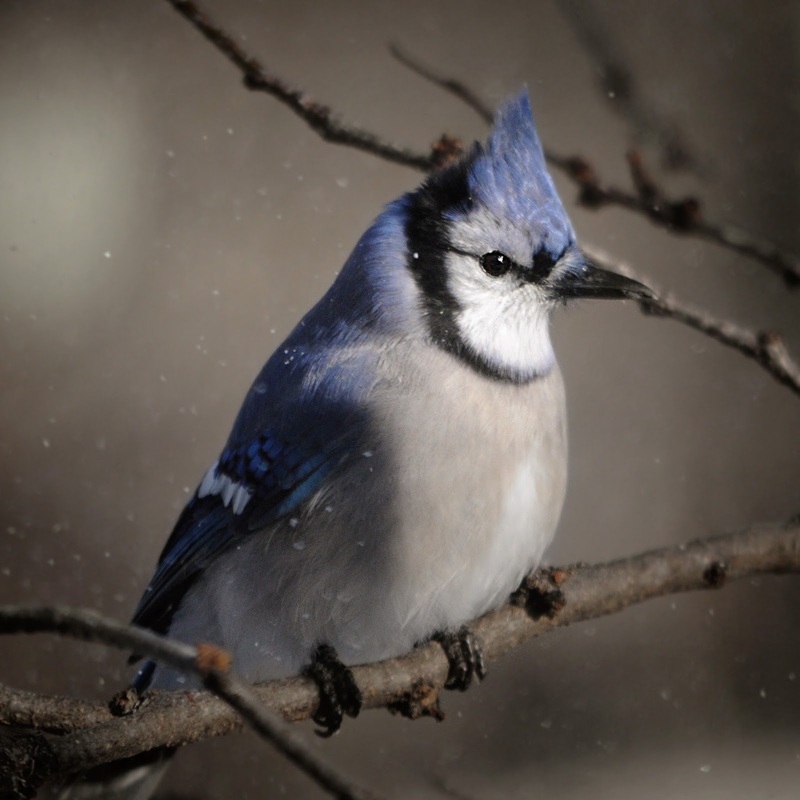 Karen looks adorable in her winter coat, so sweet with her eyes screwed up tight and look how fabulous the Blue Jay looks against the snow, even more stunning that the Cardinal. Wow, Totally stunning marco shot, just look at the reflections in the water droplets, amazing. I too always hope for a little less wind at Christmas and I don't eat sprouts lol! Your card is a festive work of art. The wreath is stunning. Your feathered and furry friend shots are always a joy to see.